Master of the "methode champenoise", Claude Thibaut moved to Charlottesville, Virginia in 2003, joining a local winery as a consultant to spearhead the creation of a sparkling wine. In 2005, he started his own label in partnership with Manuel Janisson, producer of the Champagne Janisson & Fils. 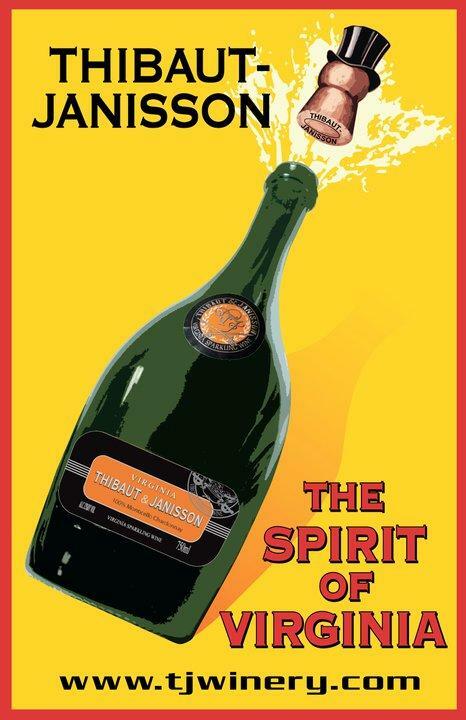 The first vintage was released in November 2007 under the brand: Thibaut-Janisson "Blanc de Chardonnay". Thibaut's career spans 25 years of expertise in all aspects of winemaking with valuable years spent in major wine markets including his native France, Australia and California. Since he graduated over two decades ago from the University of Reims in the heart of France's Champagne region, Thibaut has demonstrated superlative ability in the production of premium sparkling winemaking in regions outside of France. Using his skill with the "methode champenoise"- a double fermentation process that creates the bubbles found in Champagne and sparkling wines- Thibaut has developed a reputation for his commitment to excellence and professionalism, making outstanding wines and receiving numerous local, regional and international awards. Thibaut has worked at some of the most exciting emerging wineries around the globe, including the Kendall-Jackson, Jordan and Iron Horse wineries in California as well as Champagne Vve Devaux, Bar sur seine, France and Yarra Bank, Victoria Australia, where his wines were voted "Best of the Best" in the 1995 Australia and New Zealand Wine Guide. The Janisson Family winery started in 1920's with Manuel Janisson's grandfather vision to produce his own wines from the vines that he grew in Verzenay, France. Starting with small acreage and buying fruit from his neighbors' he vision and labor produced a signature style, which stands today as Champagne Janisson & Fils Tradition. Manuel grew up within the winery and was tutored in all facets of the operation, from vineyard management, winemaking, negotiating for grapes, to selling and delivering of the Champagnes the winery produced. The early 90's presented Manuel with the opportunity to enlarge his vision to carry on the quality and tradition that he inherited. He invested in more land for vines, built a state of the art winery and put his experience as a negociant and businessman to the forefront, allowing for the expansion of his family Champagne. The family tradition of winemaking continues, as Manuel and his wife Marie-Eve's three children are learning the heritage, tradition and the business of Champagne. Today Champagne Janisson is proud to present a range of quality Champagne's that are recognized and greatly enjoyed internationally from Europe, Great Britain, Asia and the United States.